160 years ago design was BIG, massive in fact. The lack of computers, digital design tools and the latest in electrical equipment did not stop Isambard Kingdom Brunel creating one of this countries greatest designs The Great Western Railway, nothing was allowed to get in his way. The straight rail line from London to Bristol was an engineering challenge and in order to keep the rail line straight the longest tunnel had to be dug, the highest viaducts had to be built and complicated suspension bridges too. It’s all about user experience – when asked why. He wanted passengers to imagine they were floating above the ground and to give them a magical experience. Even then Brunel was thinking of service design. (IK Brunel to architect Matthew Digby Wyatt, 13 January 1851, as quoted in LCT Rolt “IK Brunel” 1957). Another historic figure who thought BIG was Josiah Wedgwood born in Staffordshire in 1739 to a family of potters. He was forced to work as a thrower for his brothers’ business at an early age due to his fathers death and continued as his apprentice until aged 38 after a bout of smallpox had to have a leg amputated. As he was no longer able to work the treadle he gave up throwing however this gave him the opportunity to explore the business from different angles and was fascinated by modelling and experimented with different designs, the mixes that made up the pottery and how to create the machines needed. Eventually he set up his own factory and built a village to house his workers. He improved the design of everyday crockery and in order to transport his goods to the wealthy in the south of England improved transport systems, the canal system from Stoke on Trent particularly and the road and rail systems. His pottery was loved by Queens and Empresses and because of his invention of the pyrometer was made a fellow of the Royal Society. We’ve had engineering, pottery and I have to mention textiles. I grew up in the Peak District in Derbyshire just a few miles from Sir Richard Arkwrights’ mills in Cromford and Matlock Bath. Because of its proximity, our school projects just had to include the man famous for his contribution to the Industrial Revolution by his invention of the water powered mill and with the help of a clock maker, a mechanical spinning machine that enabled a stronger yarn to be produced without the need for as much human labour, to produce cotton cloth. 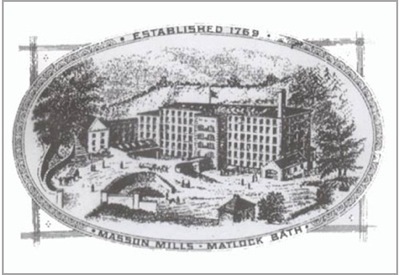 Arkwright went on to have mills in Manchester, Matlock Bath, Cromford and Scotland. Some of my ancestors worked in his mills in Derbyshire. In the C20th design got smaller. It was more about usability, ergonomics and how things were designed, these designs then going abroad to be produced. Now in the C21st things are changing again, designers today are using technology with textiles, for fun but also with a serious side. Textile designer Joanne Hodge former graduate of Duncan of Jordanstone College of Art, with a Masters in Design is currently a Ph.D student at Dundee University working with wearable technology and smart materials. Previously Joanne has created beautiful items out of recycled textiles using her skills to draw and design with special dye which alters when exposed to heat or UV light. Her work is available to view on flickr and blog. Im excited to see what Joanne creates especially as I was fortunate to be one of her students during my time at Dundee College. During his lecture Professor Mike Press urged us to think BIG, to aspire to be BIG to use what we know and take it further, to use our life experiences. So how can we as design students make a difference, how can we think big? We have to ask ourselves questions, how do we define ourselves, do we care about the world, do we want to make a difference? To answer these we’ll need knowledge, we’ll have to understand design and the importance of the creative industry and how it works. We’ll also have to understand the nature of work in design and also the role of design in times of danger. But we’ll also have to consider our other talents and bring them into play to make ourselves unique which in turn will give us a distinctive difference and finally keep reinventing ourselves keeping our ideas fresh and new.